Former White House Press Secretary Jay Carney is essentially doing the same job since being taken on by CNN – serving as propagandist for the government, award-winning journalist Ben Swann told RT. RT:How common is it that a White House official goes to work for news channels to comment on policy? Ben Swann: Actually, it's becoming very common – that's maybe the most alarming thing about this. Jay Carney's move to CNN – the headline on Huffington Post and on BenSwann.com yesterday was: “Who’s Surprised?” No one. No one’s surprised that he would actually make this move. Why? He's actually just one of a long line of press secretaries who then takes a high-profile job at a major US network. Dana Perino over at Fox News was with President Bush. David Axelrod has done it – there’s a long line of these folks who do this as their next career. RT:What's in it for Carney? BS: Well, a big, fat pay check, obviously, is always nice. But also, it allows him to continue to push forward ideas that this administration wants out in the public spectrum. Obviously, he's a believer. He believes in what this President is doing. And in this position – now he comes off not as spokesman for the President, but an analyst, as a pundit. But he’s not. He’s just a spokesman for the President who’s now not wearing a tie. That’s the only difference between what he was doing behind that podium in the White House to where he is today over at CNN. If you saw the exchange last night between John McCain and Jay Carney – I’m sure CNN loved it – they said it was this showdown between McCain and Carney. It wasn’t. It was two guys arguing over something that was almost arbitrary, instead of talking about the real issue which was to do with ISIS. RT:Why is CNN flushing out so much cash – why would they hire someone like Jay Carney? BS: Why does Fox hire Dana Perino? Why does MSNBC hire David Axelrod? They hire these guys simply because they fit the political agenda, which is, here’s someone who has lots of contacts, someone who has lots of access, and they’ll be able to get us all these exclusive stories and bring all this fresh insight. And they have kind of a hint of celebrity to them. But in realty they’re just propagandists – that’s what they do in their official capacity working for the White House, and it’s what they transfer to do. Listen, it’s not about hating on these guys taking these positions – but they're not journalists. 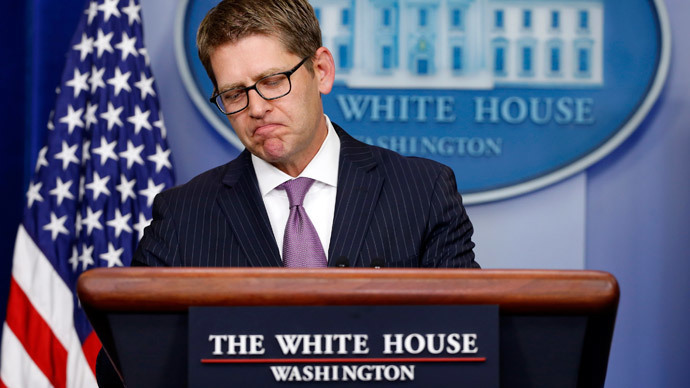 Jay Carney was at one time a journalist but he gave up that role when he went to work for the White House. RT:What does this say about modern politics and the media? BS: Well, what I think it comes down to here is that media in the US really for the most part does not care about journalism. They care about the idea of celebrity and access and that’s what these guys represent.